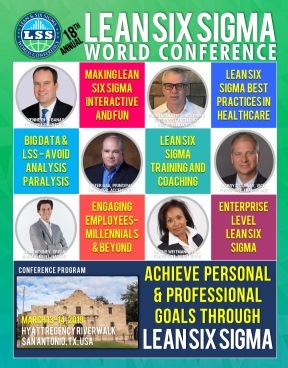 As the organizers of the Lean Six Sigma World Conference, we pride ourselves in bringing together the best experts and practitioners from around the world. There is a very simple reason for this — Lean Six Sigma (LSS) is defined by its real-world, practical application; thus, making its practitioners the best teachers. At its core, LSS is a powerful, pragmatic paradigm, defined by its primary philosophy that efficiency and quality are the “most” fundamental components of effectiveness. Elimination of waste cannot remain an academic endeavor. Moreover, it can be applied broadly and can be used concurrently with other methodologies. There are companies all over the world, of all sizes, that are using a “Lean way of thinking” without even knowing or naming it. The Apollo 11 mission to land the first two humans on the moon, one of which was Dr. Buzz Aldrin, provides a most beautiful example of applying the principles of LSS. “Lean” because it required a minimalistic approach to the process, and “Six Sigma” because it required maximum precision of the target for landing. This conference is a place where “Lean-minded” companies can come together, share insights, and advance the broader application. Hope you can join us!